A customer in the specialty chemical industry commissioned B&D Plastics, LLC to manufacture two custom PVC storage tanks for a monochloroacidic application. The customer supplied us with initial 2D CAD drawings, which allowed us to design a tank that would meet all of their specifications. The 5875 gallon tank was composed of PVC with a steel liner, and would provide storage of chemicals up to 160 °F. We chose PVC because its easier to insulate and featured very good strength and thermal properties. 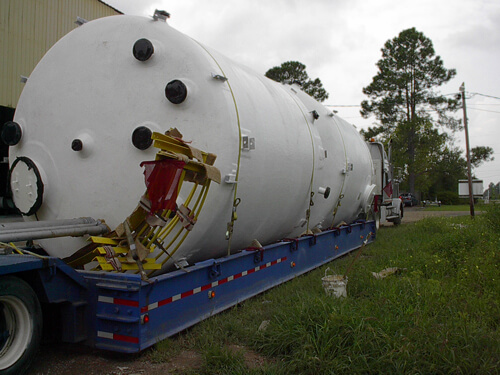 The finished tank which was 13' in height, with an outside diameter of 12'-9", was finished with paint and a gel coating, then shipped to our customer's location in Louisiana. Both tanks have been in service with this customer for six years to date, providing maintenance free service. For more information on this project, see the table below or contact us directly. PVC Storage Tank Manufacturing This chemical storage tank is used within a monochloroacidic acid storage application.